Payment delays and insolvencies will probably increase until the new USMCA trade agreement is ratified and the US import tariff issue is resolved. The sector is highly exposed to US import tariffs of 25% on steel and 10% on aluminium, as exports to the US amount to more than 80% of all Canadian steel and metals exports, affecting 45% of domestic steel production. In 2017, steel and aluminium shipments accounted for 3% of Canada’s total merchandise exports to the US, and about 2% of the country’s total exports. Currently the impact on the industry is difficult to determine as it is unclear whether the US tariffs will be long lasting for Canada. In any case, with the preliminary agreement of the new USMCA Agreement (replacing NAFTA) the outlook has improved that for Canada the tariffs will be removed in the foreseeable future. In H1 of 2018 results of many Canadian steel and metal businesses were still positive. Canadian exports benefited from a weaker exchange rate of the CAD against the USD. However, in H2 of 2018 and into 2019 it is expected that the US tariffs will affect performance. Competition in the market strongly intensified at the end of H1of 2018 as customers were shortening orders due to the uncertainty caused by the US tariffs. While it was originally expected to see more consolidation in the industry, this has not yet materialised, and with the improvement of the outlook we are not anticipating any change. Payments in the Canadian steel and metals sector take 65 days on average, and payment experience has been good over the past two years. It is expected that both payment delays and insolvencies will increase until the new USMCA trade agreement is ratified and the US import tariff issue is resolved. 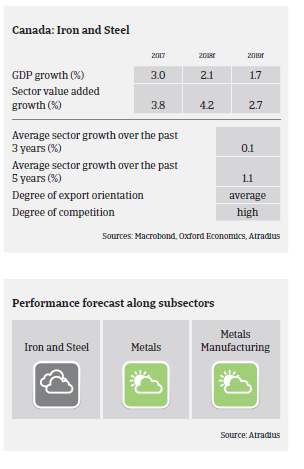 Our underwriting stance is generally neutral for the steel and metals industry, based on a more optimistic outlook after the USMCA agreement. We are cautious in our assessments should buyers be impacted by the US tariffs, but are supporting cover based on positive financial, bank and credit agency data.